Orbis Books, Maryknoll, NY 1988. In the essays that make up this volume, Aloysius Pieris confronts two of the most urgent, complex, and therefore promising questions that face the Christian religion —or any religion — today; ……… the question of the many poor and the question of the many religions. Pieris finds himself in a situation where he has no choice but to face these two issues. As he reaches out into the Asian context ……… he is met by the realities of Asian poverty and Asian religiousness …..(and) he has come to realize not only that Christianity must respond to both these issues, but that it must respond to both of them together. 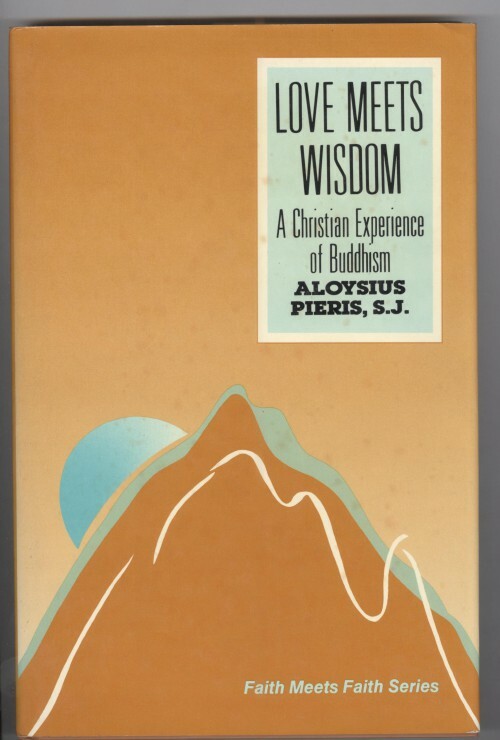 Within the framework of a pluralistic theology of religions, Pieris explores the social as well as the spiritual dimensions of Buddhism, its doctrine and political vision, and issues pertinent to an interreligious understanding between Christians and Buddhists. 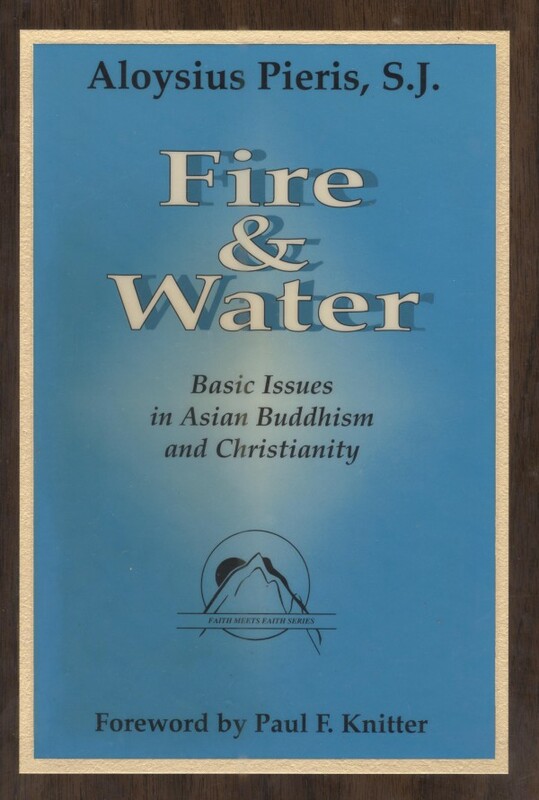 In Part 1, he presents the history of western Christian and Asian Buddhist encounter, discusses the merits and drawbacks of an academic approach to interreligious dialogue, and explores the spiritual dimensions of West and East. Part 2 provides a window to understanding Buddhist religious life, not only its basic tenets but how it is experienced in the lives of its adherents. Pieris explores the spiritual and then the social and political vision of Buddhism, the most pervasive of what he calls the “metacosmic” religions. Part 3 takes up the challenges of dialogue between Christians and Buddhists from the struggle to overcome the many divisions of culture, politics and religious belief, through to the basic core of sharing that is essential to a truly dialogical encounter. An extensive “Glossary of Buddhist Terms” adds to the usefulness of this volume, particularly for those participating in, or just encountering, the Buddhist-Christian dialogue. The essays in this book bring together two processes which are seemingly divergent as fire and water, but are really two very different poles of the same religious energy —the mystical and the prophetic. Throughout these essays, Pieris contrasts and connects dyads which, like fire and water, are not synonymous with, but related to, the creative tension between mystical and prophetic contrasts, and connects the creative tension between mystical and prophetic experience: the unifying transcendent and the engaging particular, the metacosmic (transcending the finite) and the cosmic (informing the finite), the detachment of wisdom (prajna) and the engagement of love (agape). This book is a lament, a critique and an appeal all in one. It laments the fact that in the very early centuries of Christianity we had abandoned the evangelical mode of expressing the two basic and inseparable dimensions of Christian existence: the mission we have received from Christ and the spirituality which is defined by that mission. Our mission manifesto, therefore, has to be concurrently a declaration of our spirituality. But this is not the case with the dominant paradigm of theology we have inherited from the past and which refuses to be dislodged. The persistence of this paradigm retards the renewal of the church’s mission and its spirituality. Even the so-called new evangelization, also conceived and expressed within this same theological language, continues to lead us further away from what we like to call here the Jesus Formula. The whole thesis defended in this little book is as simple as the gospel which it claims to re-state. As a Roman Catholic Priest and a Jesuit, Aloysius Pieris is heir to a rich tradition of Christian Mysticism, which he generously shares with his readers in a simple and readable style. He addresses himself in particular, to Christian lay-persons fully engaged in the duties of their state, to pastors spent out in ministering to their flocks, and finally to religious brothers and sisters who have consecrated their entire lives to the service of the needy. To them he offers a sound theology of prayer which has been aptly recapitulated in the title: Mysticism of Service. “My reflections revolve round a theology of prayer which takes for granted that everyone knows to pray. According to this theology, God does not leave us alone; She speaks and we somehow or other respond. This mysterious conversation, which we call prayer, at times takes the guise of a creature denying the Creator or just ignoring Her in practical life. Even this twofold reaction (that of the “atheist” and the “agnostic” respectively) is warmly welcomed by God as a legitimate response to Her gentle and incessant communication with His creatures. God’s conversation with us never ceases even when it is dismissed as a learned illusion. 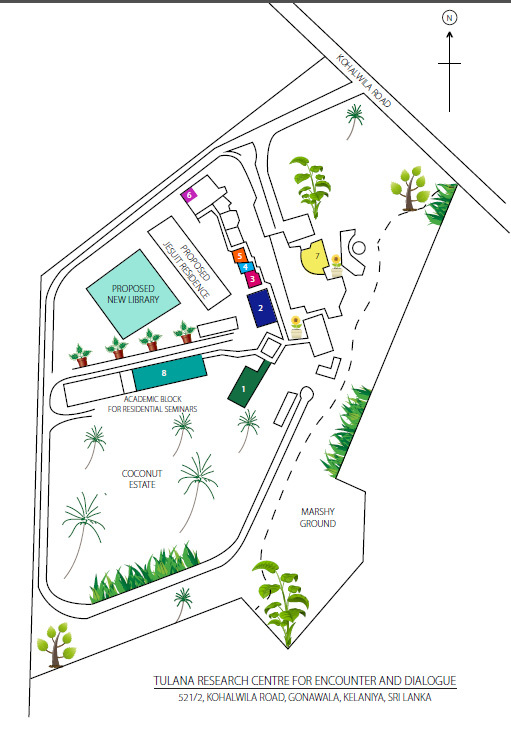 LOGOS (39), Centre for Society and Religion, Colombo 2002. “This book is the humble beginning of an ambitious project, the first in a series of several such volumes envisaged for publication in the near future. The ten chapters of this first volume have already appeared in print as separate essays in various journals or anthologies. Their sequence, here, corresponds more or less to the chronological order in which they were first published, revealing a time-span of twenty six years between the first (1978) and the last (2004). Traces of their origin as disparate essays may still be noticed despite my editorial effort to bring consistency and coherence in the cross-references as well as in the use of certain terms. The original source is indicated at the beginning of each chapter” (Aloysius Pieris). Humour and reverence blend in true religion. To laugh Evil out of existence is more religious than to be morbidly obsessed by it. Those over-defensive about their religion and over-critical about that of others reveal an irreverence born of ill-humour. All religionists and ideologists who claim to be the sole saviour of human kind turn out to be pathological messiahs, intolerant crusaders and fundamentalist evangelizers. They have taken their own religiosity too seriously and their religion too lightly. Their humour is in the wrong place. The converse would help them to acquire a reverential mode vis-à-vis the religions of their neighbours. This is not an academic theologian’s analysis of the teachings of Vatican II but a pastorally solicitous presbyter’s passionate appeal to all Asian Christians to understand, appreciate and appropriate the paradigm shift which this most ecumenical and authoritative council in history has offered us in order to make us think, act, pray and live ecclesially as a symbol of hope and a sacrament of reconciliation in the cultures round us. In Part One, Aloysius Pieris s.j. discusses the thinking that animates the mission of all Jesuits. He looks at what constitutes the true “heart” of Jesuit spirituality within the context of the current popular devotion to the Sacred Heart of Jesus, and links it to the prophetic mission to the poor; he also revisits the Faith-Justice Mission mandate, and studies again the “Two Standards” in the Ignatian Exercises in terms of the struggle between the Politics of Power and the Spirituality of Service. In Part Two, he talks about the prayer that accompanies the actions of the Jesuits. Considering spirituality as a constant daily “mindfulness”, he goes back to Ignatian and biblical sources to distinguish between formal and informal prayer, dismissing the contemplation-action binomial in the process of answering the often asked question about Prayer and Work – which takes priority ? Part Three looks at the process of formation which maintains the Jesuit identity in their mission as ‘frontier’ men. Jesuit Governance is argued as being neither monarchic or monastic and he makes a case for training Jesuit Communicators of the Word, starting from the Juniorate level. He also distinguishes between ‘priests’ and ‘presbyters’ in an effort to re-read and re-capture the true Jesuit charism, specially after the Second Vatican Council and the Jesuit General Congregation (GC) 31 of the 1960’s. Although the chapters of this book originated as many talks and articles addressed to the members of the Society of Jesus, they are published here also for the benefit of non-Jesuits who are actively engaged in the affairs of the church and the world, either as lay Christians or as diocesan clergy of various denominations, and specially the members of non-monastic apostolic Religious Congregations. For what is advocated here is the Christ-centred lay spirituality that Ignatius of Loyola had discovered as a layman for us from an ecclesiastical tradition that goes back to St. Paul and the nascent church. What is new in this anthology is the author’s attempt to bring out clearly the biblical foundation of this spiritual tradition. This is a fictional Diary of a Country Priest which contains the aspirations that God’s People entertain about the role of presbyters and bishops in the church as well as a frank discussion of the various challenges that the churches everywhere are facing in these our times. It covers seven days from Monday to Sunday during a conclave to elect a new pope. The diary entries from Wednesday onwards record Fr. Frank’s joy at the election of Pope Peter Paul 1 from South America (“We have got our Pope at last”). A long-overdue halt to a scandalous millennium? Presented here are a series of acts that stare at the face of those who care to trace the story of the church over the past two millennia. Aloysius Pieris believes in the providential timeliness of Vatican II that it was intended to expose the root cause of all the ills that befell the Catholic Church specially (not exclusively) in the second millennium. Selecting twelve abuses that marred the image of the Roman Catholic Church in the ten centuries that followed the schism of 1054, he argues that one reason for these “horrendous scandals” was that the Western Patriarchate in Rome had lost all ecumenical contact with the other four (eastern) patriarchates of Constantinople, Antioch, Jerusalem and Alexandria, which in the first millennium exercised a salutary restraint over each other, including Rome. This book was completed long before our dear Franciscan Jesuit inaugurated a new spell of papal ministry witnessing to and restoring the prophetic vision of the “Church Poor” and “Church for the Poor” that Vatican II and Pope John XXIII had projected before us, but which had gradually faded away from the church’s horizon during the last thirty five years. Much of what is proposed in this book is bound to be less difficult to assimilate today than during the past three decades during which its contents were churned out with the co-operation of many colleagues in the academe and many collaborators in the field.